Apple's much rumored larger iPhone is said to be a variation on the iPhone 5c rather than the iPhone 5s, according to a new report from Mac Otakara. Sources indicate that the larger iPhone would be an expansion to Apple's lineup rather than replacing the positions currently held by the iPhone 5s and 5c. Mac Otakara's sources claim Apple has decided on 4.7-inch and 5.7-inch displays as potential candidates for new iPhone models that would launch later this year. These two sizes originally were singled out by Reuters in a report published last year. This new iPhone model may keep the basic design of the iPhone 5c such as the rounded back edges, button designs, and speaker/microphone hole designs, with some inspiration from the seventh-generation iPod nano. The latest iPod nano models are available in a range of colors like the iPhone 5c, but feature an anodized aluminum design instead of polycarbonate. Sources also claim the 4.7-inch iPhone will measure at 14x7 cm, while the 5.7-inch model will be larger with dimensions of 16x8 cm. Possibly both models will be 7 mm thick with a protruding rear camera as seen on the current iPod touch models, although it the report indicates that the final version of the phone could be expanded to 7.5 mm thick to match the thickness of the camera module. The design for the phones should already be complete for a launch later this year, so it is unclear if Mac Otakara's sources are sharing information from earlier in the design process or if there is simply still some uncertainty in the sources' information. Rumors about Apple's next generation iPhone have been scattered, with reports suggesting the iPhone 6 will adopt a "bezel-free" display and a 10-megapixel or higher camera module with an improved filter. A sketchy report from earlier this year also claimed Apple was working on an iPhone with a 5.6-inch display that would not be marketed with the iPhone name because of its experimental nature. Mac Otakara has a reasonably strong rumor track record, correctly predicting the dual-LED flash for the iPhone 5s and the designs for the fifth-generation iPod touch and seventh-generation iPod nano. …I may be doing something wrong. Everytime I hold the 5c, I'm impressed with its design. Feels much nicer in my hand than my 5S. It'll be interesting to see what they come up with. I will wait to see iOS8 before I will even consider another iPhone. Ugh. Just bring back the iPhone 4S design with a larger screen. Why is that so hard. IT was the best looking iPhone to date and gave the best reception! I don't want the 4.7 model to be the "midrange", like the 5c, and the 5.7 inch model to be the flagship. I for one do not want a screen larger than 5 inches, but also don't want to have to buy a midrange phone. 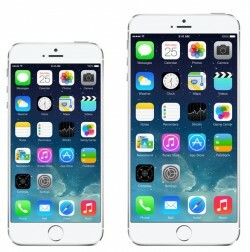 Just make the iPhone 6 available in two sizes, both same quality, and call it a day. I just pictured it looking like a mini iPad mini. It's well known that the iPhone 5C didn't sell anything like they anticipated, so doesn't make any sense to base your next flagship model on an under-performing product. I actually bought a 5c, and I'm very impressed by the design. After spending over a year with an iPhone 5, it's a welcome switch because I can actually hold it without a case. Anyone dismissing the 5c too easily clearly has never used one. Yes it does, I always wondered how long apple would be able to put out super high quality builds.......I guess the 5S will be known as the last really nice build. I may jump to android before buying apples super duper magical plastic..............that nobody like to call plastic. The article clearly states it would NOT be plastic. I don't know where everyone is getting this (perhaps not reading the whole thing). They said it would be the same design as the 5c, with the rounded edges, but in anodized aluminum.